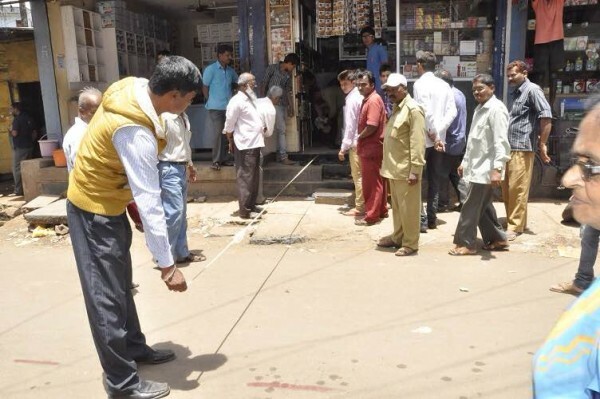 The city corporation on Tuesday has done marking and reviewed the properties in Kadolkar Galli that need to be demolished as the road is stated to widened to 40 feet. Sources also say this road has been taken instead of Ramdev galli. The Corporation plans to take release deeds before commencing work by which there wont be any litigation mess. But if in this case release deeds are taken or asked for, it means NO COMPENSATION will be paid to the property owners which is their right. Masterplan can be implemented only after payment of compensation, the September 29, 2016 order of the ministry of urban development makes it clear that if some private property has to be acquired for the process of road widening, the entire land acquisition process according to law must be followed by the City Corporation or UDA. Only BUDA to issue TDR in Belagavi, Now the land owners will receive twice the area of land surrendered in lieu of monetary compensation as development right; and one time the building area surrendered as estimated by the value of the building and divided by the market value of the land. In case of road widening, the available front setback shall be permitted setback after road widening. Road widening was hampered as the property owners went to court with the only intention of getting compensation and still their cases are pending with the Regional Commissioner. The property owners who approached the High court in their writ petition had clearly said that, they dont oppose any kind of development but at the same time they must get the compensation as prescribed in the law.